Perhaps the only opportunity to chase with Ted Best our host for the trip, we headed out to our target in western Texas - southwest of Childress. I preferred the area to the north of Childress if it fired simply based on the windshear. When towers did go up, it did in both areas. We headed out of town to make our decision. Well, let's say the ones to the southwest won out, and so did David and Ted. I suppose my reasoning was that we could catch the ones to the southwest. But as we neared, we noted the storm we had been watching had weakened. 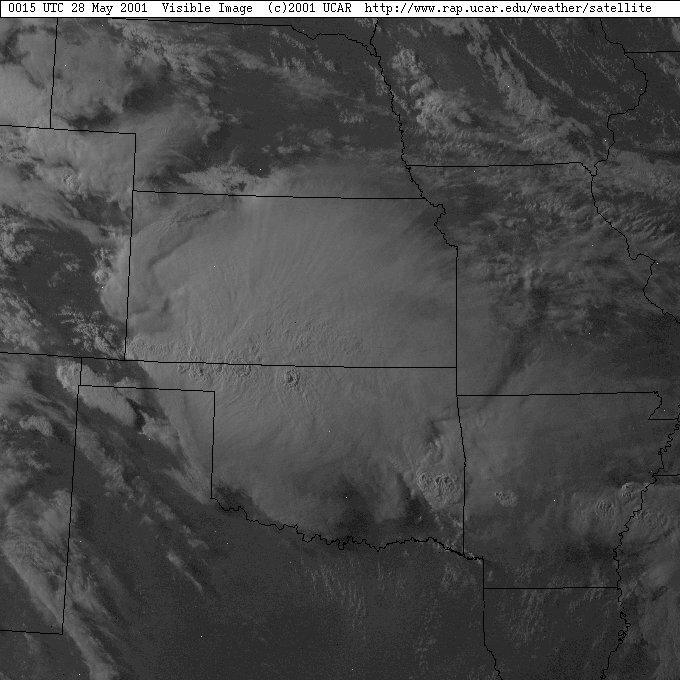 Lack of contrast and haze had hidden a second cell to the south. 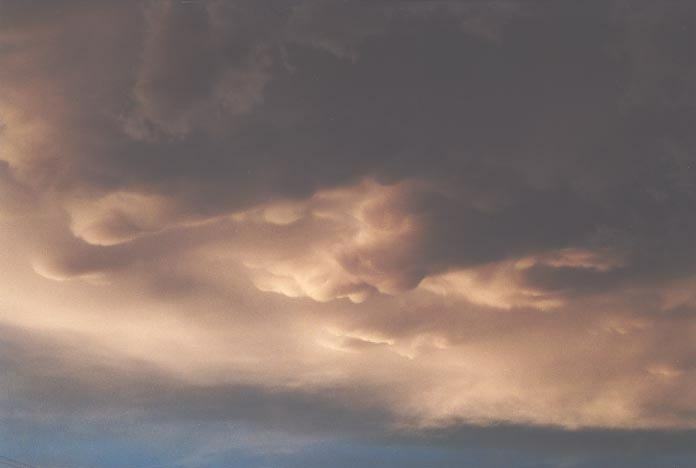 The anvil was facing southeast and it soon became evident that this was a right mover. Damn!! It would now become more difficult to catch. We eventually did catch up. Decision time. 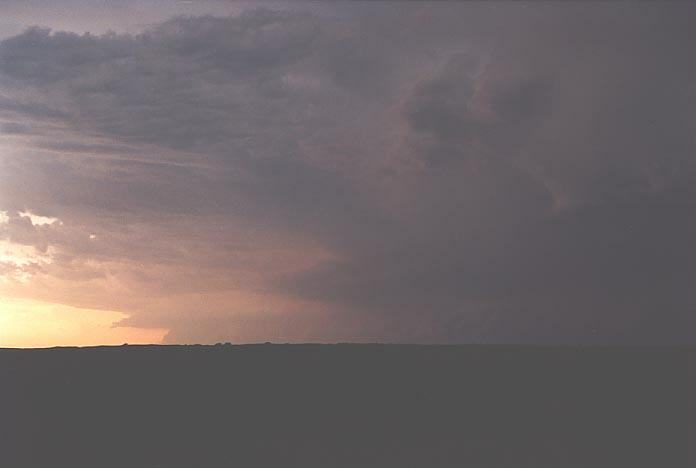 Ted did not want to punch through this supercell which had large hail to golf ball size reported. Understandably so. At this point we parted and headed south and gradually south-southwest towards the core. 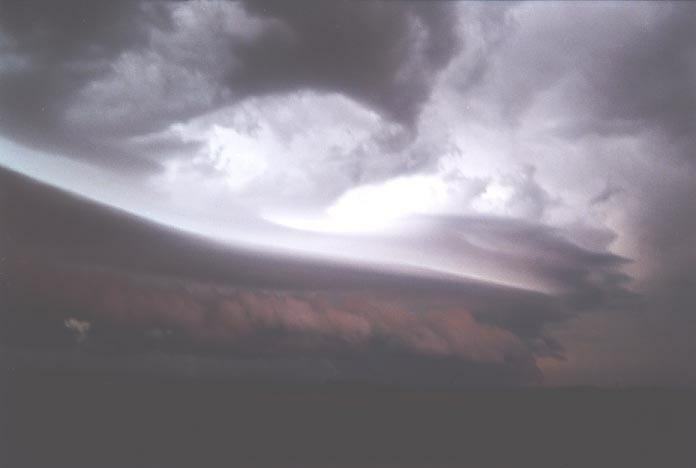 We then realised it was an LP supercell and we were on the wrong side. Unfortunately, the more we headed south, cell development was shifting south-southwest. We were not able to get onto the southern side of the storms. 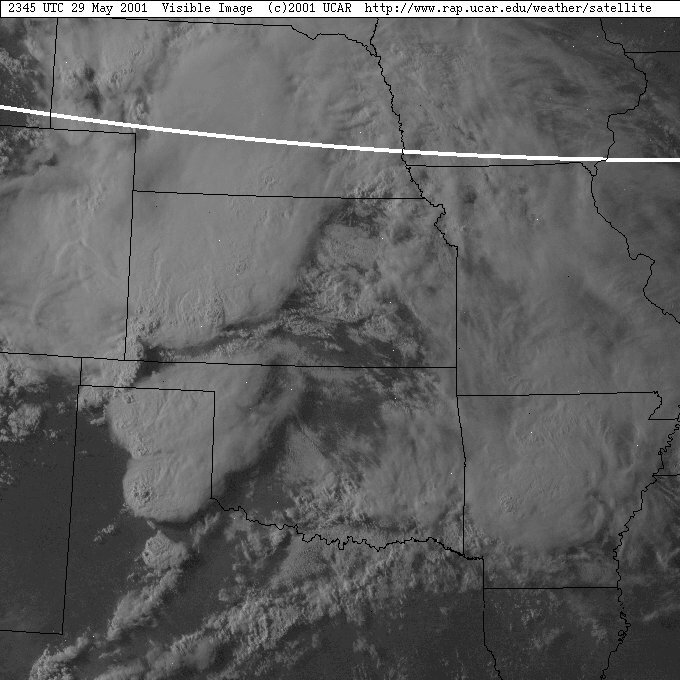 The anvil was extensive, not surprising considering the relatively weaker upper level winds. Another Sunday, with no models until 1pm. Worse still, this was the Memorial Day Weekend so libraries in most towns will close over the weekend except major towns and Universities. So again, a rough target area was used as a guide and we headed for Lawton, Oklahoma. What a mistake, we both had forgotten the library did not open Sundays anyway. Damn!! We were on our own. The Weather Channel had indicated this area, and the NOAA radio had also placed a moderate risk in this area. 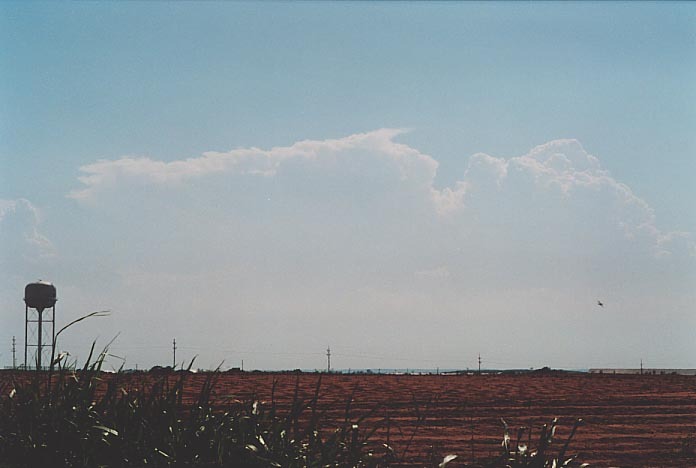 However, as we neared the region to the northwest of Lawton, we noticed that the wind had turned southwesterly and the cumulus field had decreased. We were absolutely disgusted as we had high hopes of this day. Even the cumulus field further east was not firing. 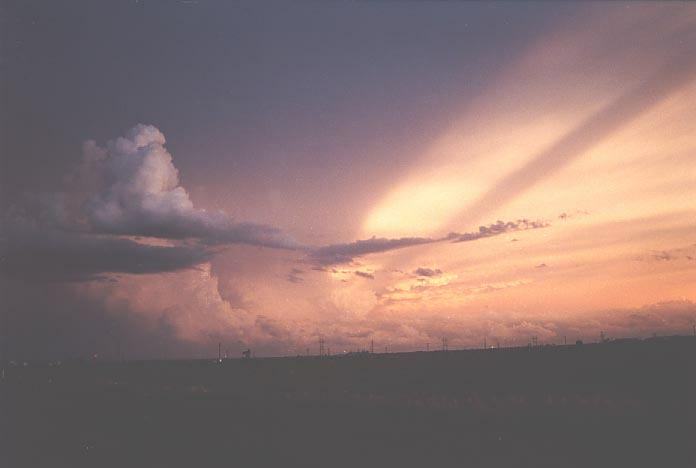 We could see storms in Kansas but that was simply too far. Finally, we decided to stick to our original plan and head northwest until we hit some development. And this payed dividends!!! 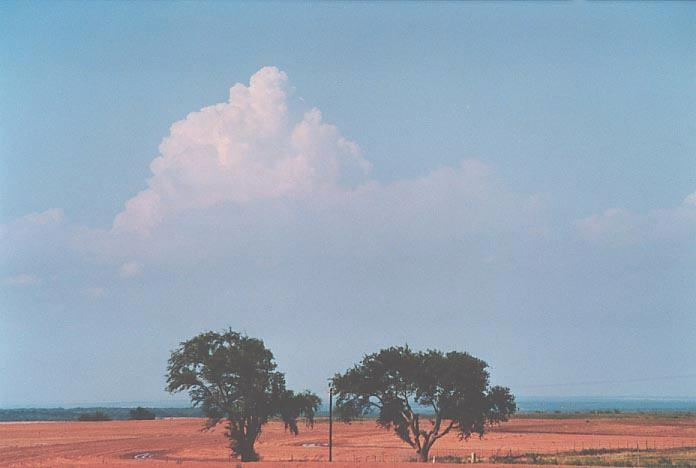 As we neared the turnoff to Woodward in northwestern Oklahoma, we could see cirrus, which I felt at least partly was from a developing or distant anvil. The cumulus field to the north was more encouraging as well. As we neared Woodward, it became obvious that a thunderstorm was in progress. The anvil quickly increased to an altostratus layer, and after some shopping, we headed west. We did not even get a chance to talk to the TV reporter whom we had parked near. 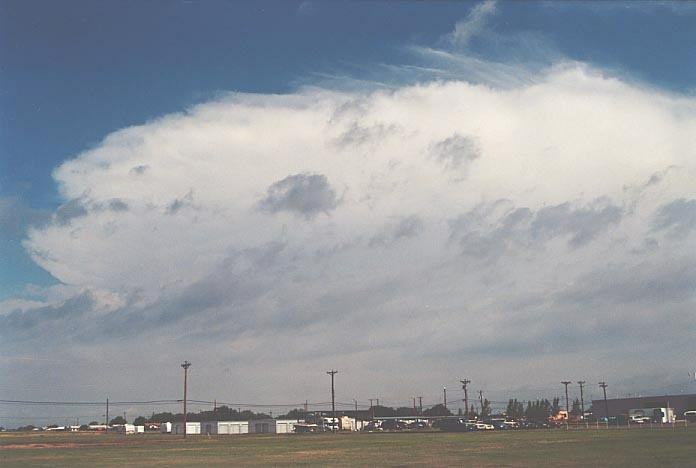 Further west, and the storm complex took shape with a clear thick anvil overhead. 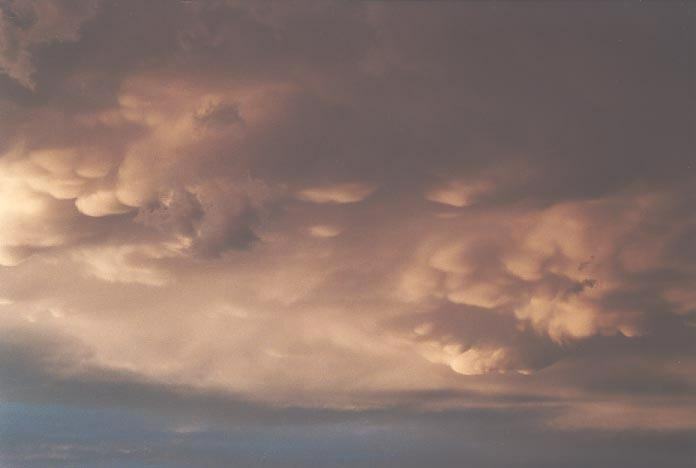 There was no shortage of mammatus from the severe hailstorm now affecting nearby counties. A warning was announced for the storm to the north basically for hail the size of dimes and heavy rain. At this stage, there was nothing fancy about this system. 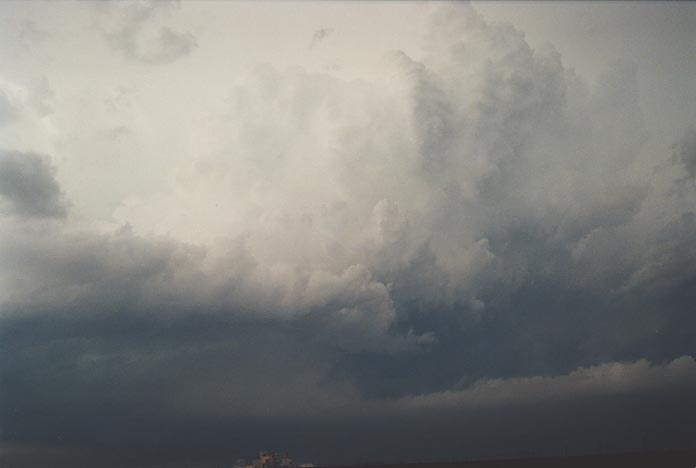 However, the storm to our northwest had begun to drag fresh to strong inflow. 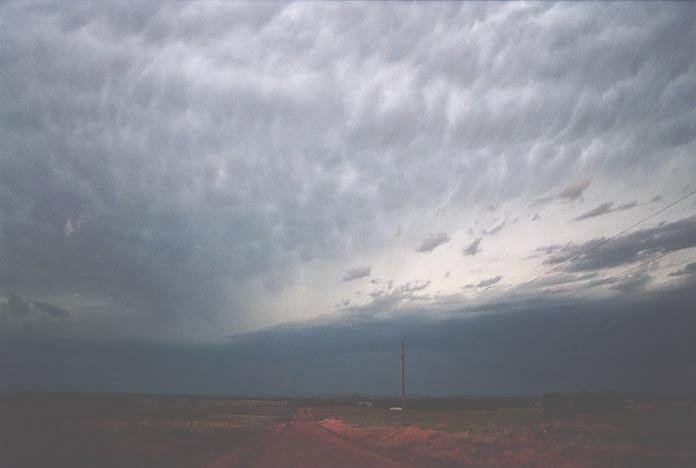 Slowly but surely, on the horizon, a gust front formation began to emerge. We headed up the dirt road for a better view. The more it approached, the meaner it looked. At times we stood in awe at the shear size of the whole system. The contrast and formation improved dramatically about 7pm and you could now clearly make out two storms including the storm with the warning. David and I thought it was close for comfort so we headed off east. The storms were heading east-southeast and we knew there were limited roads south as well as our main road that headed southeast past Woodward. The further east we travelled, the more spectacular the storm became. 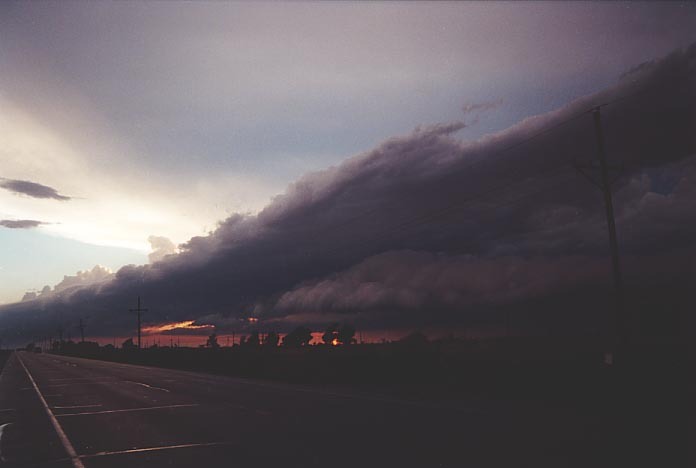 We stopped twice; before and after Woodward to take stills and video of this incredible cloud structure. 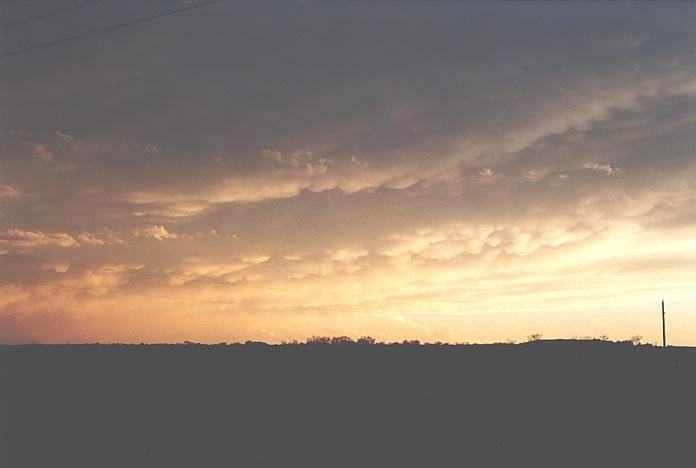 David then heard reports of base ball sized hail in a county to the north. 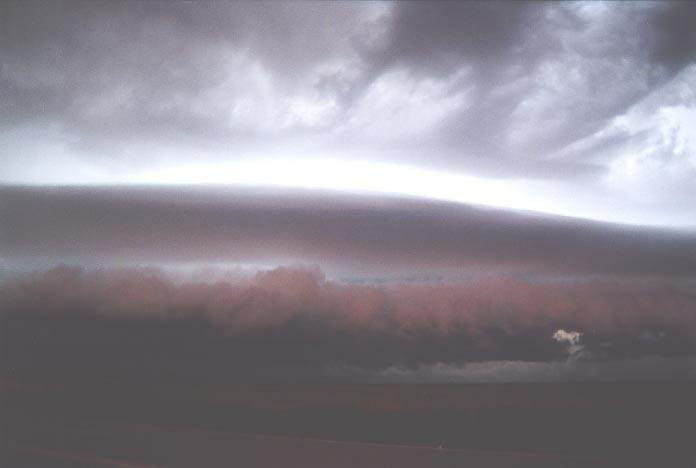 The structure developed into one of the most impressive shelf cloud formations reminiscent of a flying saucer with three lenticular layers. It was as if a fluorescent light was shining through these layers in the fading light. And then, lightning. For more photos of this event taken on David's camera, check out: David's Report on this storm. Yes lightning flashes were frequent but of more interest were the impressive lightning bolts consistently striking the ground and pulsing several times to the southwest. Now what also made this incredible was that it came out of the thicker part of the anvil section just ahead of the gust front structure, almost all from the same region. We made it past Woodward and then headed south. The relative position of this lightning got closer and closer to our vehicle. I must have been out of this world as I went "nuts" every time a bolt would drop and pulse. In fact, at one stage I went ballistic: "That one pulsed 9 times - whoa -hohh - ha". And I was the one driving. So much enthusiasm and a storm chasing you down is an excellent way to shield the distance. Suddenly, flash boom followed by another pulsing bolt all within half a kilometre. You could even hear the static on FM radio. I have included some of the highlights of this part of the trip. Now it was decision time. We seemed to barely gain position ahead of this storm chasing us down. Could we make it to Lawton in time? It was a close call but we decided to give it a go. Bad move - as 5km from Lawton, we had to pull under an overpass. Winds were simply too strong and had accelerated ahead of the main gust front. Steering was difficult as wind gusts of about 130km/h or so hit the vehicle. Even under the bridge, the car was rocking!! Then David and I noticed a glow on the horizon and the small city went dark. This glow persisted for 10 seconds and I zoomed on it. There seemed to be no lightning around? Unfortunately, this turned out to be a tragic part of the chase: a power pole had been toppled over by the severe winds falling on a woman killing her. 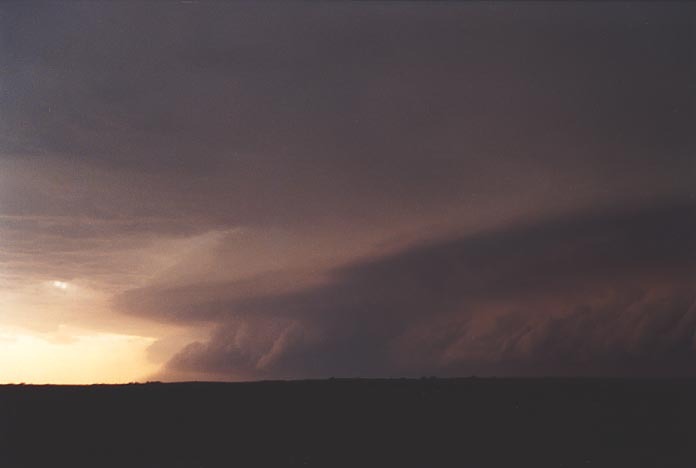 This storm had taken its toll with extensive damage reports from Woodward to across the border into northern Texas. We stayed the night in Lawton and viewed video footage on our viewfinders discussing what had happened. Certainly a breathtaking storm. Here are some radar and satellite images for 27th May 2001 event. A mesoconvective complex again stablised the air and introduced low cloud. We observed breaks in the cloud and watch as middle level cloud also moved through. Another bust. 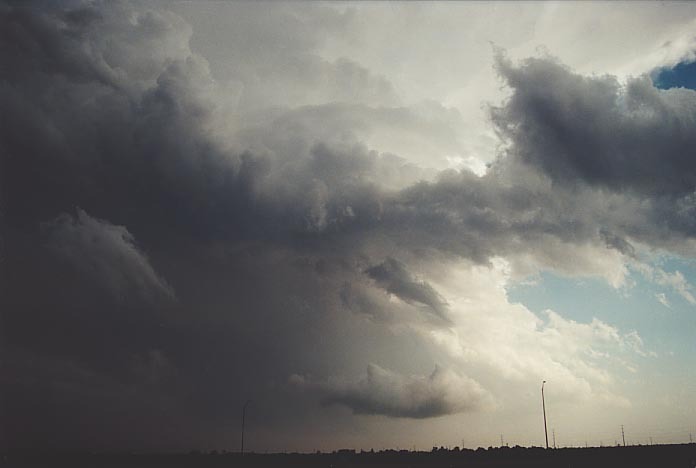 We were a few hours short of the tornadic weather that hit parts of Colorado. Oh well. 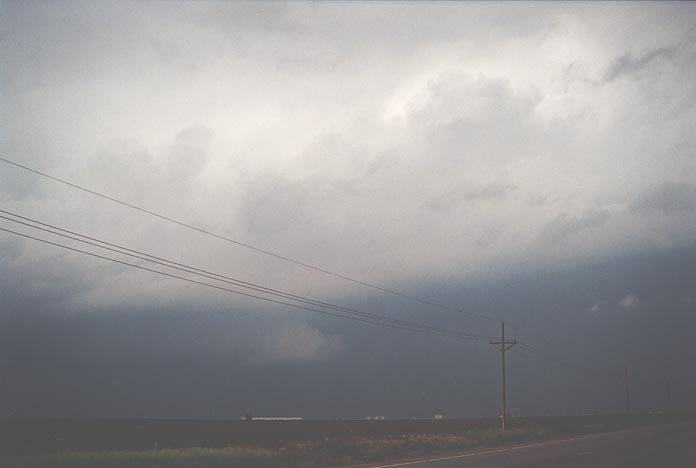 Anyway, in a hope to be closer to the border and any storms that may come through, we headed for Dumas and stayed there the night. After early morning severe thunderstorms, we awoke to stratocumulus cloud just visible above the thick mist. The mist and cloud broke sufficient to reveal and thunderstorm anvil. Once ready to leave we took photographs and some video of the side-shearing anvil to the northwest. For an early storm, it looked rather impressive. There were no problems with libraries being open on this day. Our aim was to quickly observe the conditions and then possibly chase this storm to the north. Target area was basically where we were in the northern Panhandle. We decided the storm could be caught so we headed after it. Bad move. Not only did the storm beat us east, we were slowly but surely getting ourselves distracted by other storms near Kansas. It is easy to observe nice looking updraughts only to find they are too far away. Just over the border of Kansas, we stopped to observe. It was an interesting stop as we could see the winds had changed somewhat and freshened from the southeast. 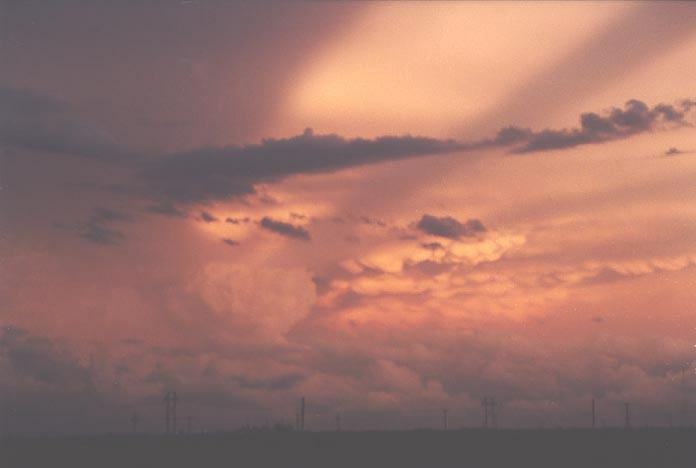 Cumulus clouds were now developing to the south and southwest including some possible cumulonimbus. The distracting storms to the north had basically fired into too many thunderstorms meaning only heavy rain could be expected from them. We went to the local library. What a shock to the system: the national weather service had issued a tornado watch for our 'target' area. There was even mention of chance of F2 - F5 tornadoes! 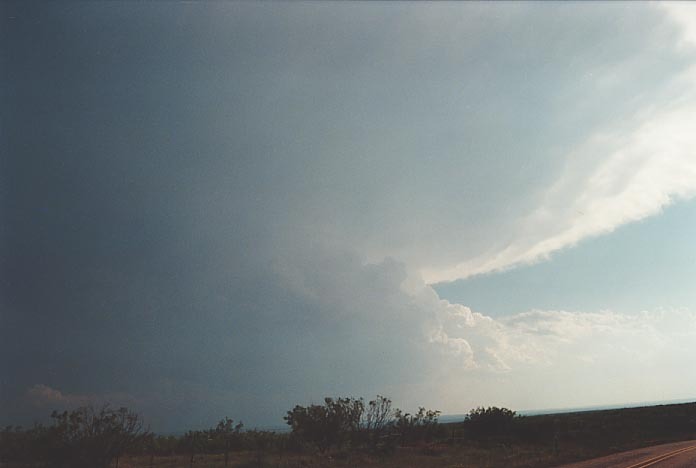 A dry line was setting up on the Texas/New Mexico border. A surface boundary flow was expected to hit the target area during the afternoon. 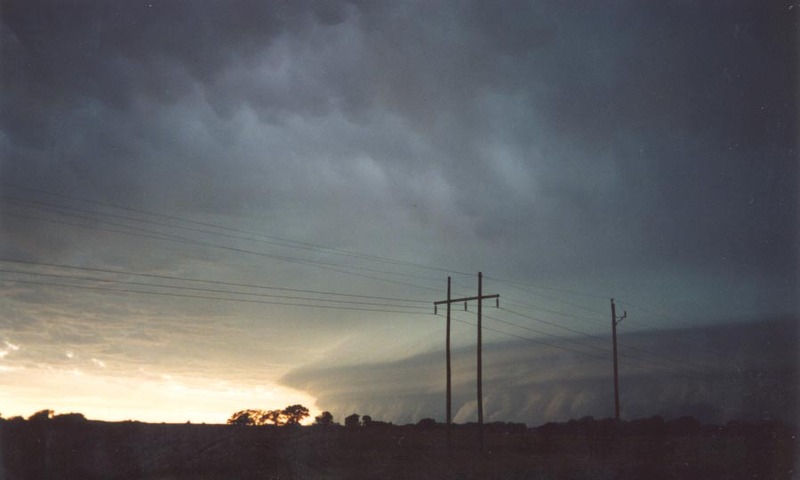 Our job was to hunt down the location where these storms would eventually fire. Was this going to be a repeat of the southeast Oklahoma case? We quickly took off and made the trek down through the Oklahoma Panhandle and into Texas again. We had observed the persistent region of cumulus to our south the whole way. We decided to take the route slightly to the west to make sure we did not miss any development. 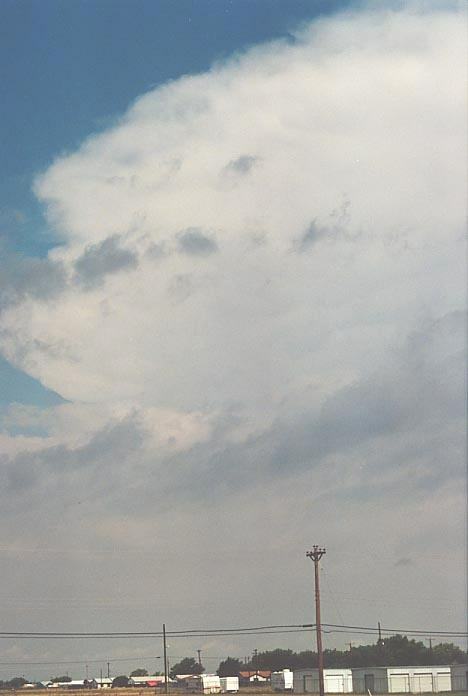 And then we saw it: a strong cumulonimbus developed into a supercell to our east. We were shattered as we knew we had missed the opportunity to get it - too late to turn back. We had to commit to our original target. 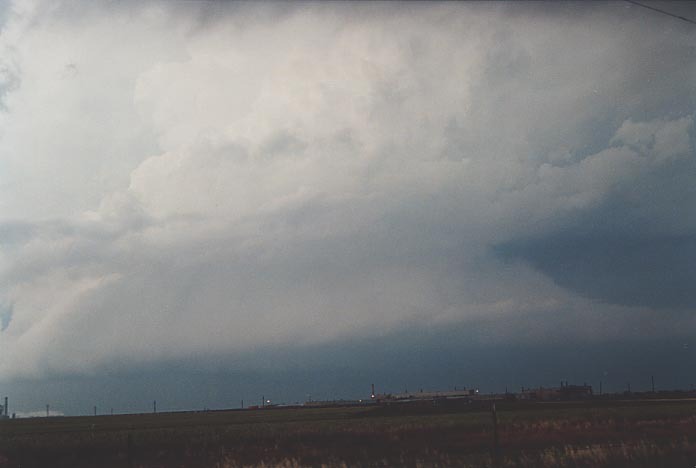 We headed further south after observing more towers and of course glimpses of the massive supercell to the east. 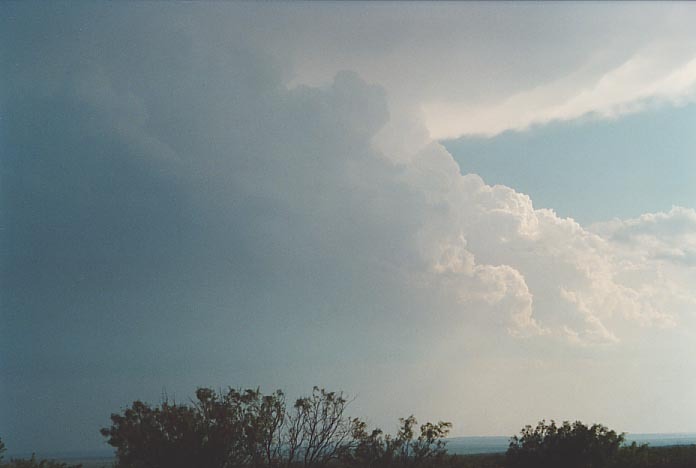 Then a line of weak cumulonimbus towers came into view to the south. All storms were aligned to the northeast. My thoughts were that this was more likely to be near the area that may take off. It was further back from the other cells and we were entering a field of more moisture. It was also a region where the left exit of the jet maximum was going to pass over. My interest though focused on what could be on the other side of those cells. The thought running through my mind was that we had to be in position on the southern side of the storm. We were playing catch up yet again after having the best opportunity to be in position earlier. David and I were furious that we may have again missed such an open opportunity. There was no excuse this time. We headed east for about 30 miles to cut across these weaker cells and then further south towards Amarillo. We drooled over the most perfect cook-screw updraught to our east indicative of the windshear environment. 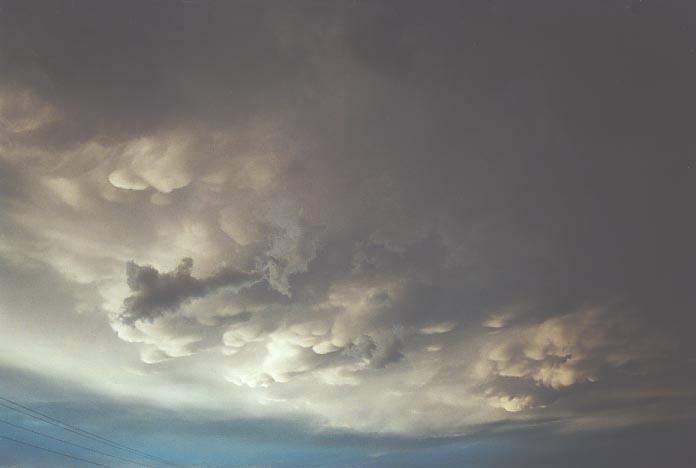 I liked what I saw to our west as well: a cluster of cells that were beginning to organise and seemed to maintain position. These seemed to have the potential to turn right if they became severe and nothing blocked their flow. There was a nice easterly flow into these storms and they were backed up along or near the dry line. They indicated good rear flank downdraughts and certainly were producing precipitation. Other than this, there was really nothing special about these cells. They were barely severe and certainly not photogenic. We finally arrived in Amarillo. Damn we missed the turnoff but to me it was a relief that we had made it on the southern side of these storms. We fuelled at a service station in Amarillo in preparation for any chase that lay ahead. I got out to pay whilst David fuelled. I could hear a screeching sound and looked around to find two cars had had an accident and were entering the service station. I was asked to be a witness but I had not seen anything. (Imagine if I had and was kept back whilst a supercell took off��.hmmmm). 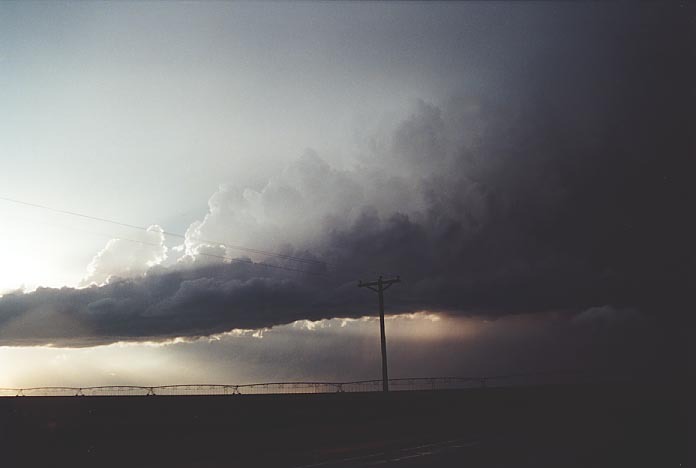 We headed just outside of Amarillo and stopped to observe developments including the NOAA radio reports. Well, it turned out that we were observing everything before the warnings were put out. We had earlier observed a dark base develop before a severe warning was put out for possible giant hail. That storm had taken off northeast. But it was the persisting cells to the west that demanded our interest - watching for signs of rotation. Well, finally we were rewarded with the first organised scud rising into the base a few minutes after inflow freshened from the east. Video and photographs were taken as this persisted for several minutes. We could hear the siren go off in Amarillo and then 10 minutes or so later, a tornado warning was issued for the storm. David also noticed a tornado warning was issued for another storm. This turned out to be a county to the south. A storm was also in progress south of this storm that we had been watching. As time went on, this southern storm developed a beaver tail and David took a liking to it. We were at this stage parked on a side road. 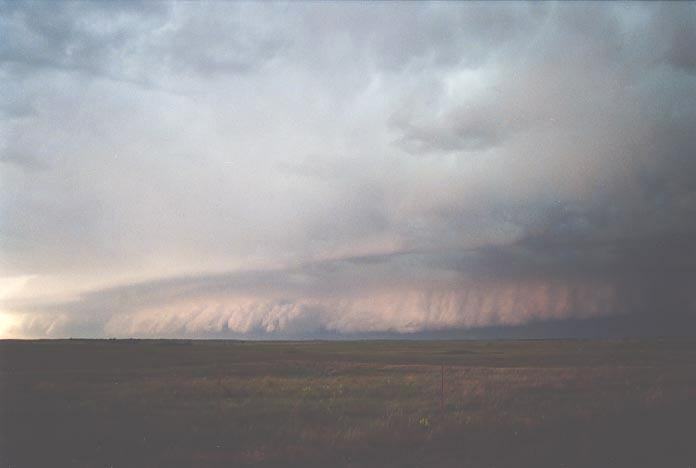 I had no idea about the inflow band until David commented on it. I suppose I was so focused on 'our' storm to the west. Then finally this storm began to reveal its structure. The transformation was unbelievable. 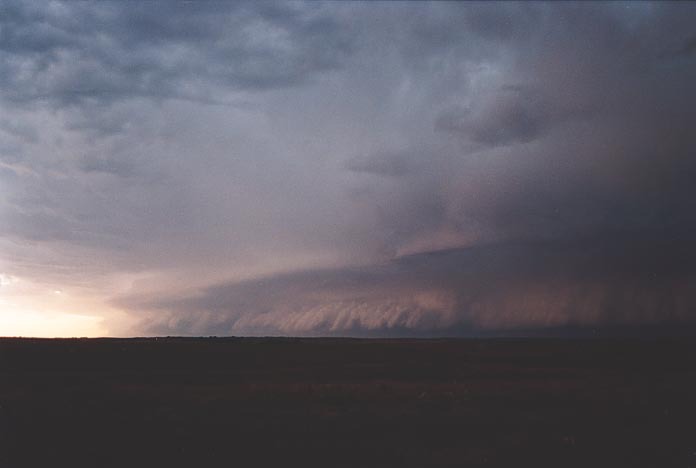 An inflow band had begun to develop simultaneously with the development of a powerful twisting updraught. What went through my mind - this was a mirror image of the November 5th Coffs Harbour supercell. I got David's attention and he also stared with astonishment. The same thing was going through his mind. Taking a real interest in this storm we took some quick footage and photographs, and headed back onto the main road. I have got to get another shot - I simply was in awe of the rotation and the incredible contrast of this developing beast. Another chaser vehicle stopped behind us. Well you know me, I could not let an opportunity go without talking to other chasers. So we introduced ourselves and discussed the storm situation. They were trying to pick which storm to go after. Well David and I had no doubt that this storm was the one to chase. After all, if we needed to, we were within travelling distance of the southern cell. Looking in the rear vision mirror, the other guys had decided to follow us!! 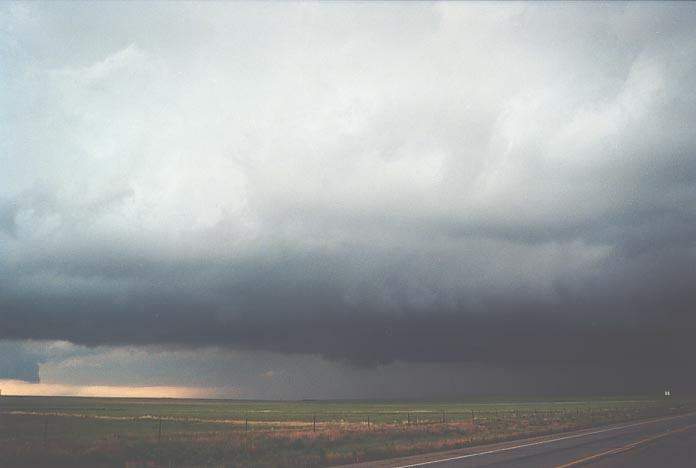 This storm was showing good inflow with now a lot of moisture condensing in the form of low cloud. This was very turbulent. We headed further northeast and could now make out the dark menacing base as well as the exploding tower. The contrast was excellent. We waited near an easterly route that could take us to White Deer. 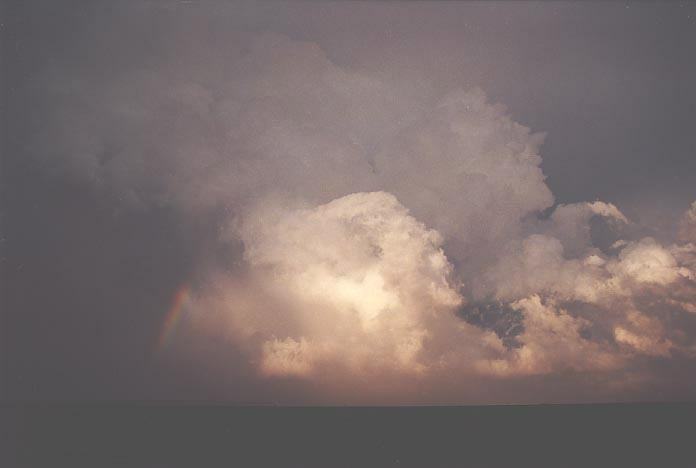 Suddenly, scud began to rise for a second time and persisted sending a funnel. The adrenaline was rushing through my body. This storm was going through text-book phases, slowly organising itself. 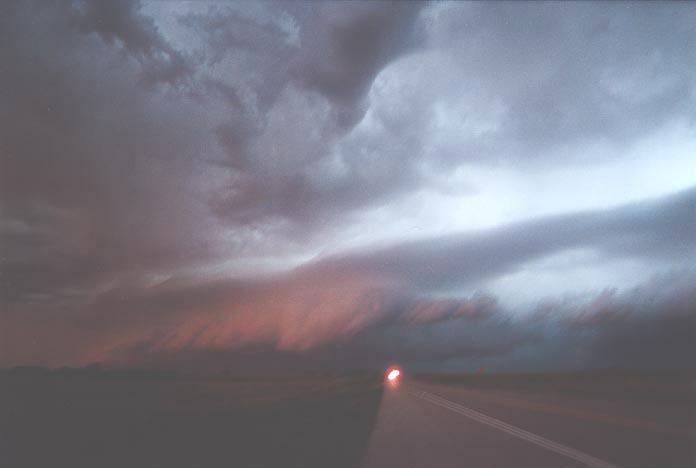 We knew it was a classic supercell but surely we could not be observing a cyclic supercell!! As I had expected, the storm had started the process of making a right turn and the circulation increased. We headed along the road to White Deer. "Funnel", David shouted!! 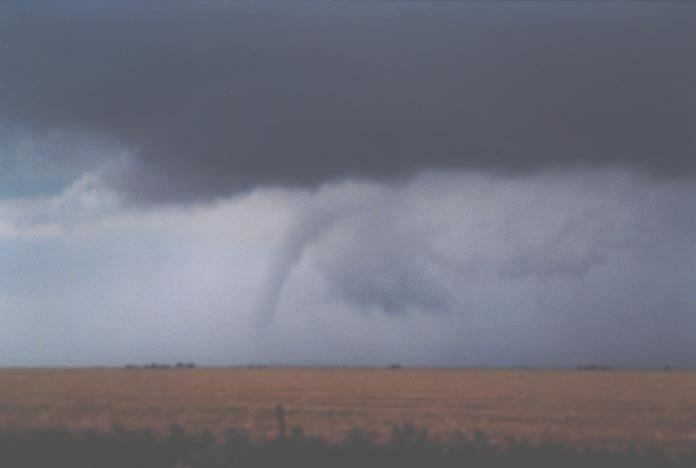 A white funnel started to form very quickly and soon hit the ground. We had a tornado on the ground. Incredible!! I quickly stopped to get photographs and video but thankfully, David had got it all on film. This lasted a couple of minutes and then it roped out. Amazing!! Rotation was still evident. We were looking around for more funnel possibilities. 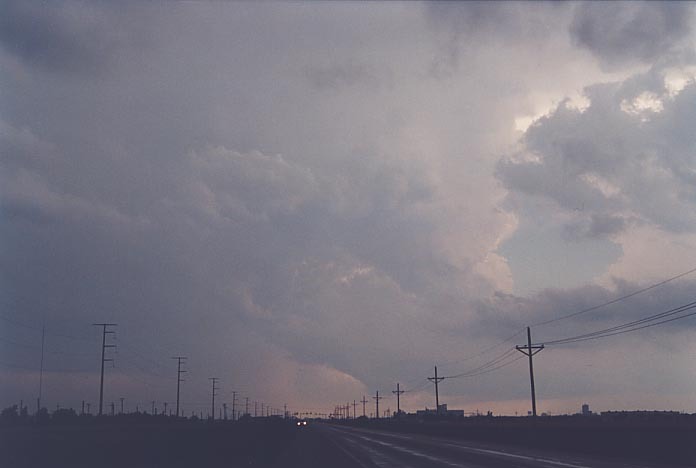 And then as we headed a little further north, David indicated another funnel and tornado to the north from a separate wall cloud. I grabbed the video camera and taped the last bit but I was not able to get it into view in time after stopping. David got it - great stuff. 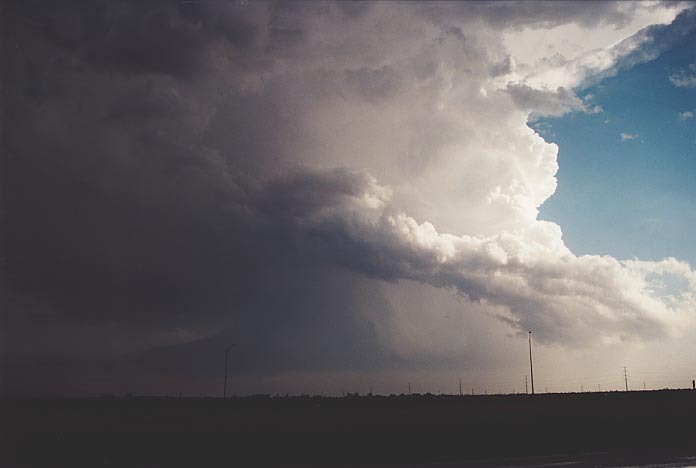 We were parked on the entrance of a gravel road when we saw an upside-down dome shaped funnel cloud developing in a similar region where the first tornado developed. I was sure that it had the inflow to develop into another tornado. And apparently there were dust whirls. This was tornado number three. Then bad news -inflow had turned suddenly to outflow. David and I commented at the same time about this outflow so we made our way further northeast. 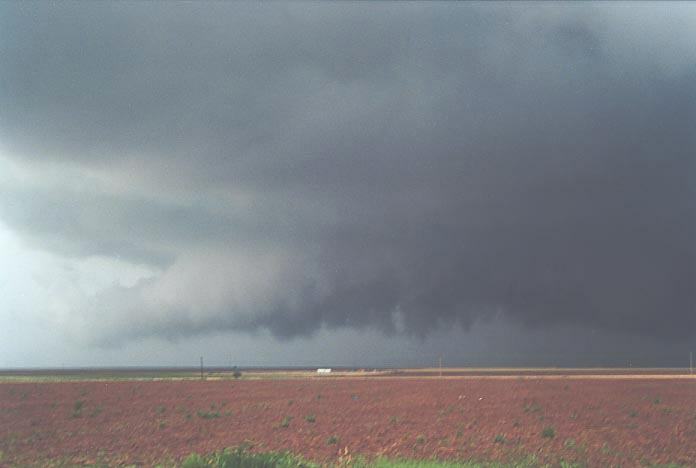 Then we noticed a base where the second tornado had developed organising into a major wall cloud. When this started to visibly rotate even from our distance, we knew something better could come of it. We stopped along the side of the road and again more video and photographs. David set up tripod to film the rotation. You could hear me screaming to "..come on - let's go!!". What happened from here on was a blur. There simply are no words to describe our feelings at this point - something I had never experienced before. This was now beyond the adrenaline stage, it was survival. There was no time to think. 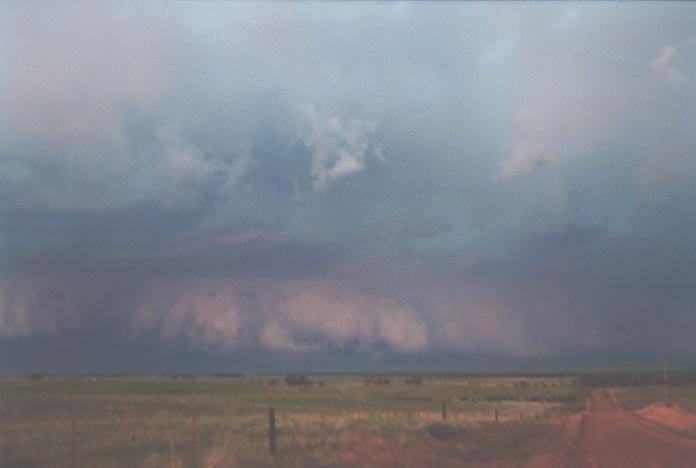 Almost automatically, like we had been doing it for years, we paced ourselves with the wall cloud in correct position, watching any developments making decisions like we had a job to do. We were being lured by the storm. Moving further up the road parallel with the storm's motion, we arrived at an intersection near Panhandle, turned left and parked with a few vehicles. The wall cloud was very low to the ground and was rotating faster. It was a matter of time that something would touch down. Winds racing into a convergence of the inflow from the west increased. You could hear the whistling in the power lines as they bent in the wind. I was extremely concerned particularly if the power lines fell. So I was in the car quick smart. We decided to quickly head up the road fearing that we could get blocked off. As soon as we turned around and made a move, David shouted "Tornado". Panic set in. Where could I park? Any roads? By the time we found a road in the small township, the tornado was not in view. Wasting no time, we quickly headed for the route back northeast. The following are videos of the major tornado at various stages described below. Lightning backlit tornado - only so brief one still available!! Alas!! Finally a funnel had redeveloped. David worked in the back seat like a machine, taking photographs and switching between his and my video camera recording the moments of the funnel descending and finally - touchdown!!! An elephant trunk at first, it quickly grew into a pipe tornado. We stopped at another dirt road intersection as the elevated railway line was in the way. What an awesome sight, a cloud of dust was already circulating this major tornado. No time for viewing, I was out in a flash. The determined look on my face was caught on David's video camera. I was out of the vehicle but my video camera wasn't. I didn't want to stay in David's way so through trying to be quick, my video camera got caught on something. Finally free, I raced around to the other side of the car, ducking to keep out of the rain and wind being wrapped by the tornado. 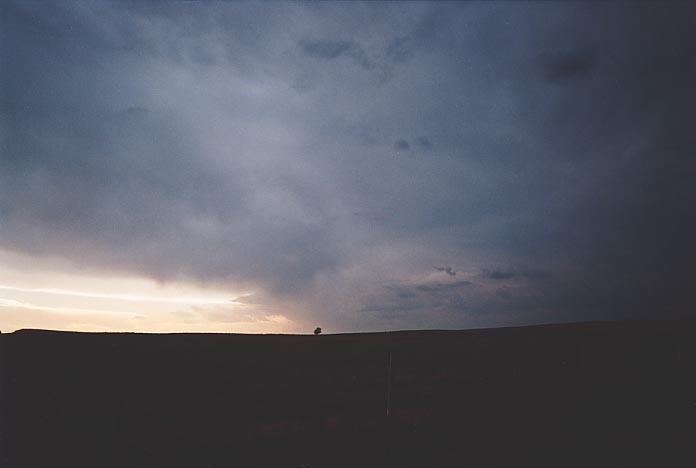 The setting could not be any more perfect - a nice flat plain, no trees, no obstacles. It certainly made good video footage. David even suggested he heard the roar at this stage. I must admit I was totally oblivious to this. A bit disgusted in fact. We quickly headed back onto the road as we felt a little unsafe being on the wrong side of the railway track. Umm tornadoes and trains don't go hand in hand. Back on the road and the tornado was not showing any signs of weakening. It was in a steady state and growing larger. 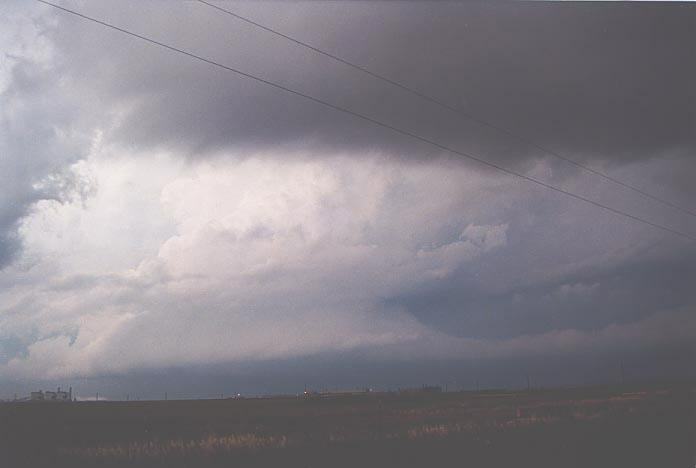 Now a truncated cone was forming above the pipe and slowly descending to the ground forming a wedge. The wall cloud below the updraught was rotating like nothing I had seen before - a clear hook structure. I was driving and filming whilst David snapped a few pictures and probably was lost out of reality throughout the ordeal. Perhaps being in the driving seat, I had to completely concentrate. 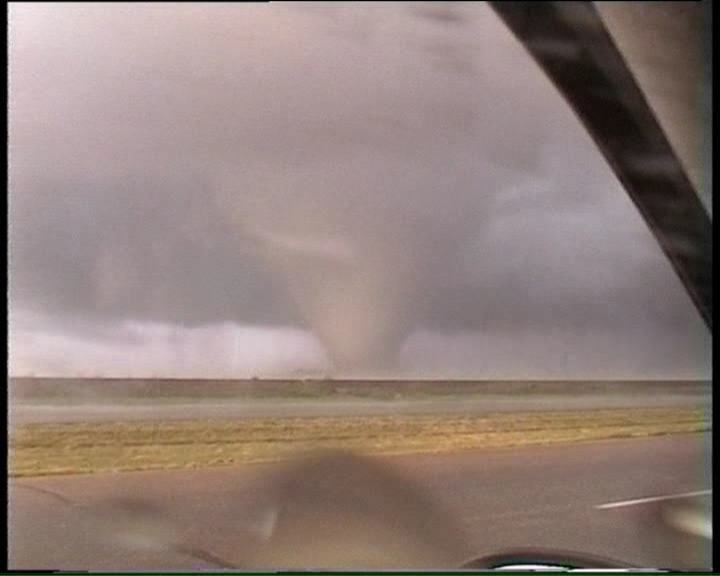 Now at times, videoing was becoming difficult as the rain wrapping around the tornado was coming inside the car. Unknowingly, it was spraying the windscreen on the inside. I hit the fan button to clear the windscreen for more video. Then the rain stopped and I was able to get some of the best footage of a major, brown Cone shaped tornado grinding away at the countryside. Then as I drove further towards the tornado, more rain wrapped around. 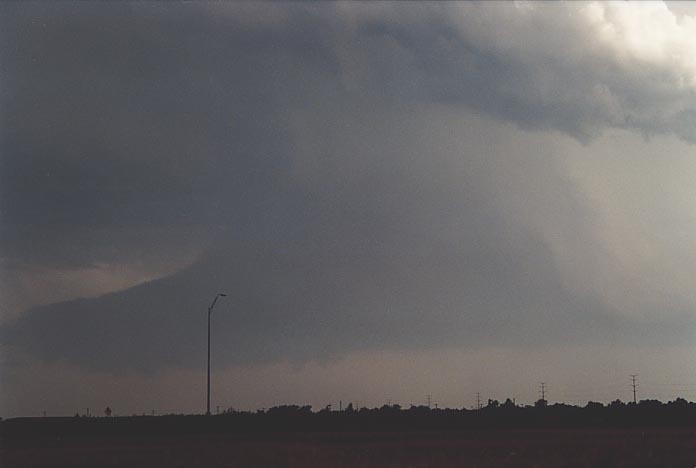 The tornado was now a barrel shaped tornado. "Look at the size of it", I commented whilst filming. I simply had not seen a tornado that big before in real life. I ran out of words to describe it. 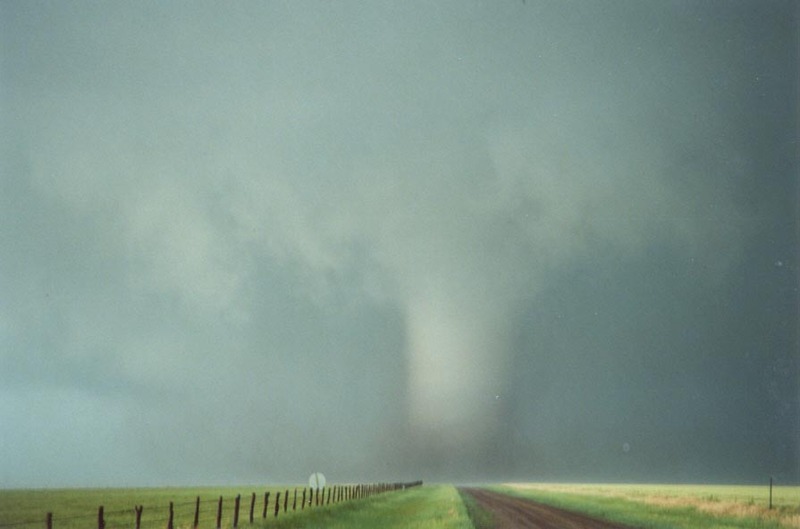 It had grown into a monster sized tornado. 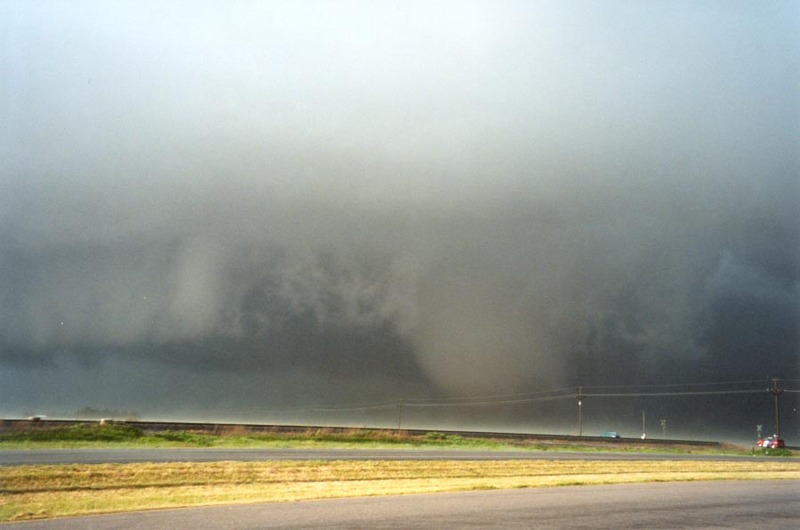 Then the inevitable happened: the large tornado was slowly becoming rain-wrapped. It slowly faded from view over the next few minutes as heavy rain driven by jets of up to 130km/h shook our vehicle. Chaser cars ahead of us turned their nose into the winds. I started to but losing sight of the tornado, I decided against it. We carefully advanced forward watching again for changes in velocity of the wind driven rain. But our run with the tornado was over: all we had were the memories and also the damage. 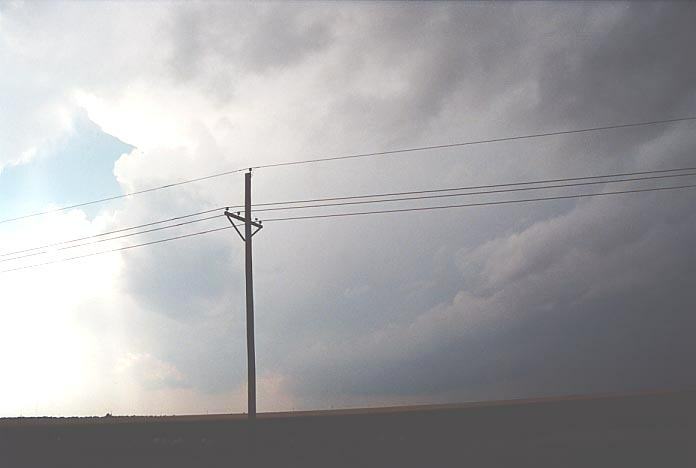 Six power poles snapped in a line on one side of the road indicated where the tornado had crossed. We even had to cross over power lines with the sheriff looking on. We made it to White Deer and passed through incredible amounts of water through town streets (lack of drainage). Then just outside of town, we stopped. The storm seemed to be getting away and it seemed to us that it had weakened. In fact, it had occluded itself in the rain-wrapping process. 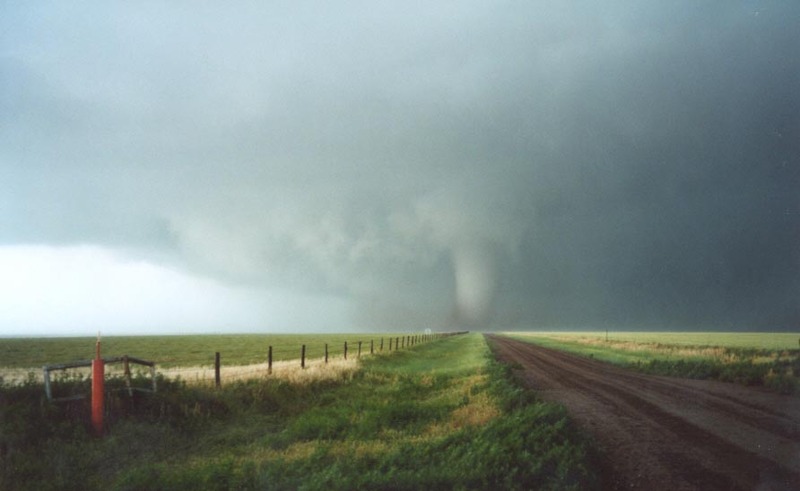 The tornado had apparently been on the ground for half an hour and reached an estimated � mile wide at the base. 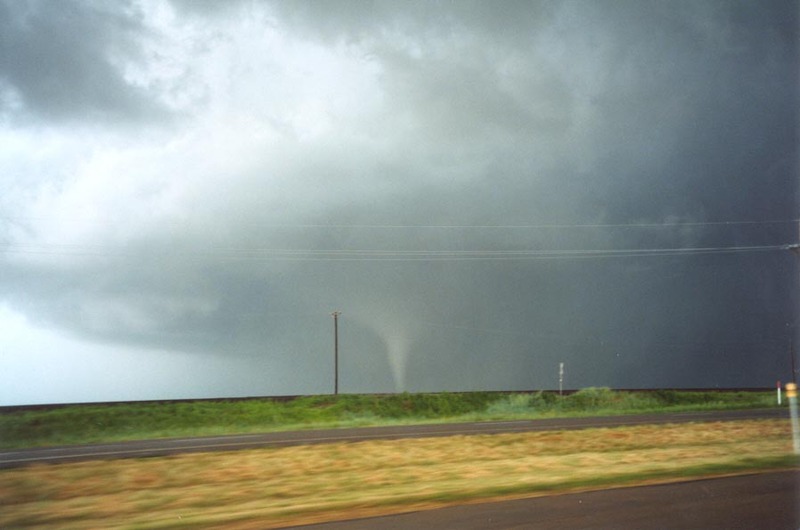 Four tornadoes had occurred with this storm. We watched a small LP supercell develop under the anvil shield. It even had a small beaver tail!! This was to be the end of the day's proceedings. 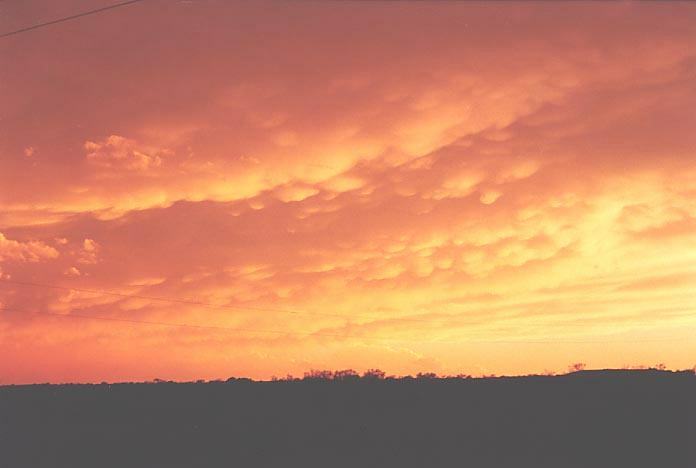 So after some evening pictures of an approaching roll cloud and mammatus, we called it quits. We made it to Shamrock where we had dinner at MacDonalds. We found that chasers such as Sam Barricklow and Gene Rhoden were here as well discussing this major tornado. It was at this stage that we REALLY began to realise the significance of this event. I found myself trembling - a mixture of excitement, nerves and fear I guess. Storm Track Article Now this may move so look around for the 29th May 2001 Outbreak. 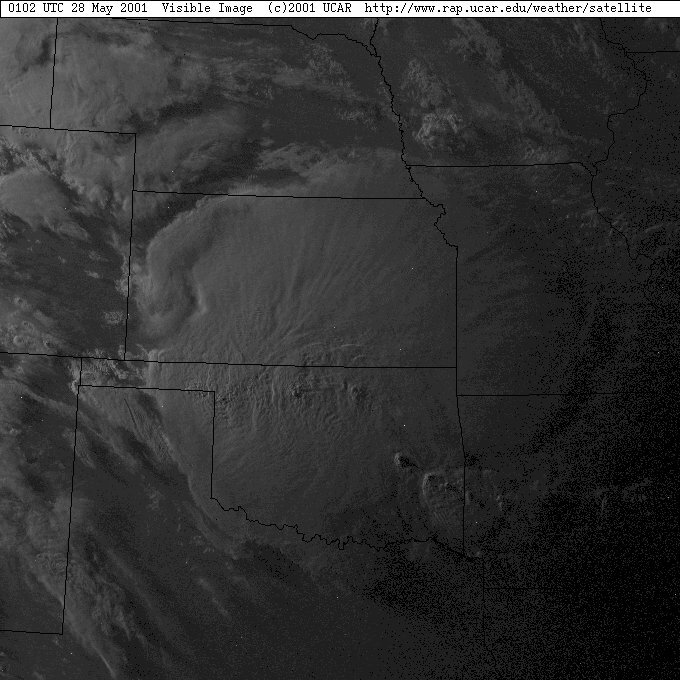 Satellite images showing the massive complex moving extending into Oklahoma Note the massive overshooting top shown mainly in the northern complex of the two. radar image 7:04pm This is the time when the White Deer supercell exhibited serious tornadic behaviour. This day turned out to be a dud - perhaps the only excitement was a persistent funnel that apparently was part of a landspout. Some chasers observed dust on the ground though I am not sure if it was confirmed. We headed back to Plano, Texas completing a second successful excursion.